The British are invading September’s Music Nite on The Strand! Beatles lovers are welcomed to participate in a free celebration of the Lads from Liverpool at Saengerfest Park. From 6 p.m. to 9 p.m. on Saturday, Sept. 8 acclaimed Beatles tribute band, The Fab 5, will be performing classic Beatles tunes for Beatlemaniacs of all ages. 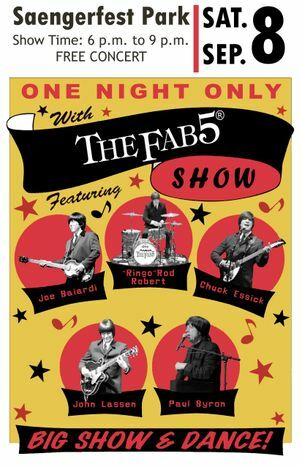 The Fab 5 have been a fan favorite in the Houston music scene for more than twenty years and recently received recognition as the “Best Tribute Band in Houston” from the Houston Press. Their use of authentic costumes and vintage instruments create a nostalgic environment that can be appreciated by all music lovers. The Fab 5’s attention to detail in everything from haircuts to humor is guaranteed to make visitors feel as excited as the girls on the set of that infamous 1964 Beatles performance on the Ed Sullivan Show. Music Nite on The Strand is presented by the Galveston Park Board and Mitchell Historic Properties. Music Nite is a series of free outdoor concerts held at Saengerfest Park, 2302 Strand beginning at 6 p.m. on the second and fourth Saturdays of the month from March through October. Saengerfest Park is located in the heart of Galveston’s Historic Strand Seaport Area at 23rd Street and The Strand. It is host to a number of monthly events including Music Nite on The Strand which is sponsored in part by Mitchell Historic Properties (MHP). MHP owns and preserves approximately one-fourth of the buildings in The Historic Strand Seaport Area including Pier 21 and Saengerfest Park. For leasing information, visit www.MitchellHistoricProperties.com or call (409) 763-5806.